En fantastisk och ståtlig riddarmålning av den brittiske konstnären Edward Henry Corbould (1815-1905). 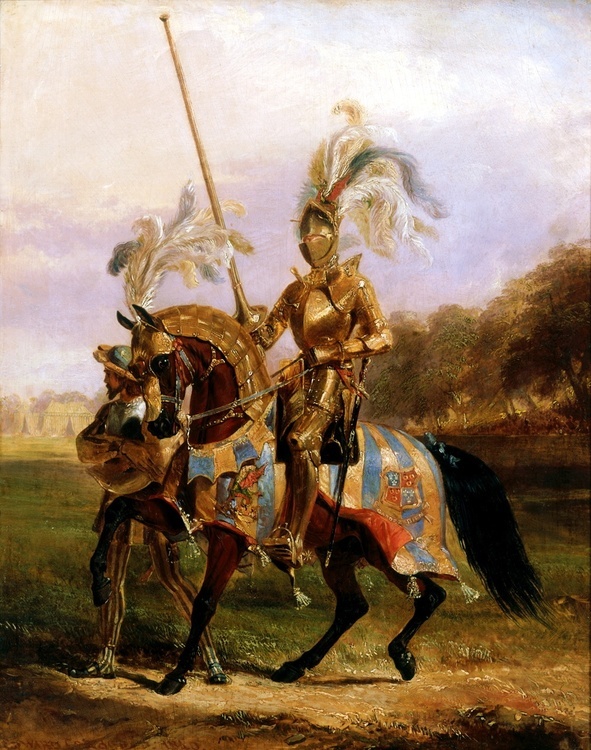 Bilden är målad runt 1840 och som modell stod grundaren av ”The Eglinton Tournament”, Archibald William Montgomerie, 13th Earl of Eglinton, 1st Earl of Winton (1812-1861). The Eglinton Tournament of 1839 was a re-enactment of a medieval joust and revel held in Scotland on Friday 30 August. It was funded and organized by Archibald, Earl of Eglinton, and took place at Eglinton Castle in Ayrshire. The Queen of Beauty was Georgiana, Duchess of Somerset.